Nissan has improved its Qashqai 'crossover' with a range of changes under the bonnet and in the cabin. An engine stop/start system features for the first time as an option on 1.6 litre petrol models and this fuel saving and emissions reducing system drops the Qashqai down one VED tax band from F to E - a saving of £15 a year. In the diesel line-up every model now benefits from a diesel particulate filter, but these green diesel improvements have not come at the expense of power. In fact, the 1.5 dCi's output has increased from 106bhp to 110bhp. All engines in the Qashqai and Qashqai+2 ranges are now compliant with EURO 5 emissions regulations. The 1.6 petrol Qashqai benefits from a slight increased output of 117bhp and 158Nm of torque (up from 115bhp and 156Nm) and is available with the £200 optional start/stop system. This automatically stops the engine when the driver pulls to a standstill and puts the car in neutral, starting automatically when the clutch is pressed enabling you to pull away. This helps improves fuel economy by up to 3 per cent. Elsewhere in the range n-tec grade gets extra equipment. Along with Nissan Connect (an advanced combined satellite navigation and audio system), a colour reversing camera, a panoramic glass roof and privacy glass it now comes with 18-inch alloys (previously a £400 option) in a black and silver finish. A Chrome Pack is available on the n-tec for £250 which adds chrome door handles, chrome fog lamp surrounds and chrome side strips. Inside, the pack also includes door and tailgate entry guards and carpet mats. 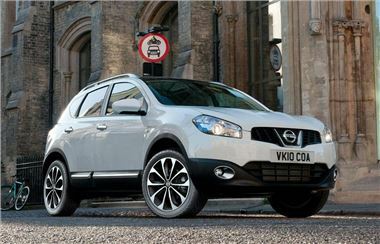 The 2011 model year Qashqai and Qashqai+2 are available to order from Nissan dealers now, with deliveries beginning in October 2010.